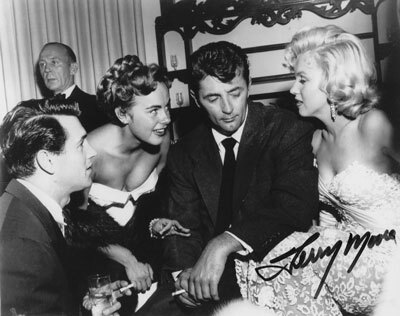 Autographed photo of Terry Moore with Rock Hudson, Robert Mitchum and Marilyn Monroe. Four great classic stars in one photograph. I just want to thank you so much for spending time with us last Saturday on the boat in Clearwater, FL. We enjoyed having you, Ann and your friends aboard. It was a real honor and pleasure to meet you and your friends. We hope you enjoyed the cruise on the waters near your filming site for “Beneath the 12-Mile Reef” in Tarpon Springs and that the cruise brought back fond memories of your earlier time in this area. 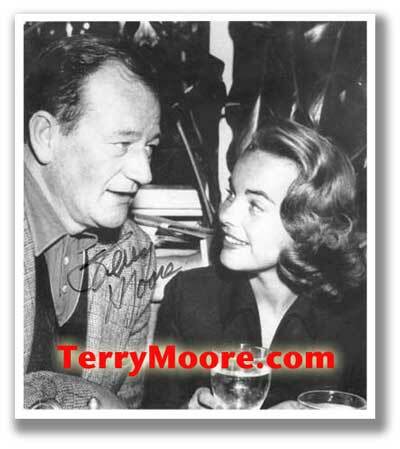 We’re proud, also, to add your personally autographed publicity photo to our Hollywood memoribilia collection on board “Dolce Vita.” We’ll treasure it along with the memories of your visit. When you’re back in the Tampa Bay area, we’d love to reprise your visit with another cruise.